ADATA presents the gaming-oriented XPG microSDXC UHS-I U3 Class 10 Cards featuring Application Performance Class 1 (A1) specifications delivering read speeds of up to 100MB/s and write speeds of up to 85MB/s. The XPG microSDXC UHS-I U3 Class 10 cards are perfect for mobile gamers to deliver faster application and gaming loading times. The XPG microSDXC UHS-I cards are ideal for smartphones, gaming phones, tablets, VR devices, and portable gaming consoles like the Nintendo Switch. The XPG microSDXC UHS-I cards offer high-speed data transfers for faster loading times with read speeds of up to 100MB/s and write speeds of up to 85MB/s. 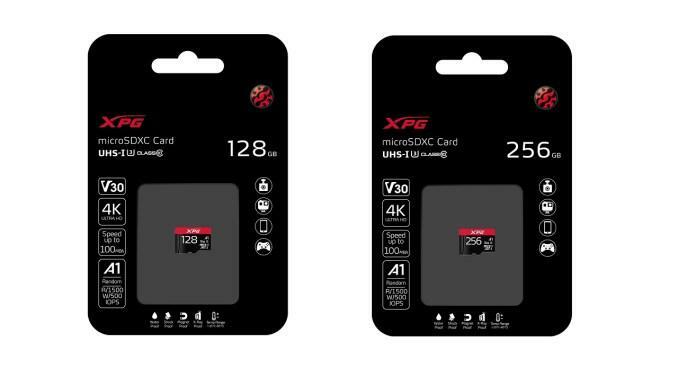 The XPG microSDXC UHS-I card is available in large capacities including 128GB, 256GB, and 512GB to provide adequate storage space for all your games’ downloadable content (DLC) and more. The XPG microSDXC UHS-I cards are Application Performance Class 1 (A1) guaranteeing high-speed data transfers to make your device run your game faster as well as run other Android apps faster. Android 6.0/7.0 users can use them as adaptable storage for additional internal storage needs and enjoy a more seamless app experience. The XPG microSDXC UHS-I U3 Class 10 cards’ availability varies by region. No information on pricing as of this writing. Learn more about the XPG microSDXC UHS-I U3 Class 10 cards here.